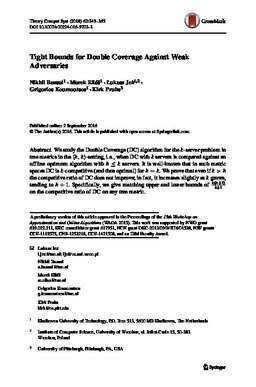 We study the Double Coverage (DC) algorithm for the k-server problem in tree metrics in the (h,k)-setting, i.e., when DC with k servers is compared against an offline optimum algorithm with h ≤ k servers. It is well-known that in such metric spaces DC is k-competitive (and thus optimal) for h = k. We prove that even if k > h the competitive ratio of DC does not improve; in fact, it increases slightly as k grows, tending to h + 1. Specifically, we give matching upper and lower bounds of (k(h+1)) / (k+1) on the competitive ratio of DC on any tree metric. Bansal, N, Eliáš, M, Jeż, Ł, Koumoutsos, G, & Pruhs, K. (2018). Tight bounds for Double Coverage against weak adversaries. Theory of Computing Systems, 62(2), 349–365.